and your character to the layout of the space. Finalise your layout of stands and spaces with our range of furniture. Industrial, design, Scandinavian, natural or vintage you will find the furniture that fits your event. 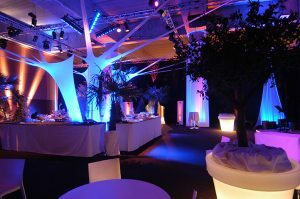 Our objective : Reinvent yourself every day and make your event unique! Nature, raw or sophisticated in addition to the furniture, play with the colours, the flooring and the materials. Are you a cactus or a ficus? We also offer a floral decoration book that will allow you to decorate your spaces with a green and floral touch. To be seen and especially to be unique, think about signage! Adhesives, through a kakemono or a tarpaulin, window stickers, or lettering … we offer a variety of media and many locations to ensure the best visibility for your event. Our site is the ideal place to promote your brand and your products. Beyond our catalogue of solutions, we offer for your communication: 17 fixed dynamic screens placed at strategic locations in Lille Grand Palais. 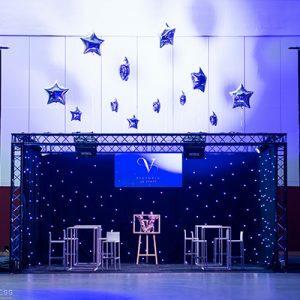 Our numerous locations offer you ideal visibility both before the event with our external signage and during your event with the interior signage. It was designed to strengthen the communication of your event or your partners but also to support and guide your participants during their visit.